Posey had his breakout season at Ohio State in his Sophmore year, 2009, with 60 catches for 828 yards at 8 TDs. 2010 resulted in equally strong numbers with 54 catches for 848 yards and 7 TDs. After controversy surrounded payments being made to players on the Buckeyes, Posey found himself suspended. An athletic talent who is a good route runner, Posey had a solid performance at the combine and clocked a 4.5 40. 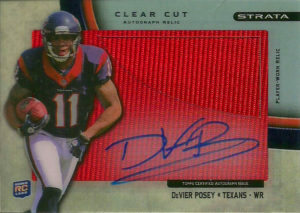 There was some hype around this pick when the Texans selected DeVier Posey in the 3rd round of the 2012 draft. At this point Houston was looking for a new compliment to future HoF receiver Andre Johnson, and was feeling really thin at the position after Kevin Walter left. Posey could not crack the Texans starting lineup while with the team. A combination of injuries and a changeover in coaches didn’t help either. He finished with 22 receptions for 272 yards in three years. The Texans traded him during the 2015 draft to the New York Jets to select Jalen Strong. Posey was cut by the Jets and then signed with the Broncos in 2016. After being released he was claimed by the CFL Toronto Argonauts but spent the season on IR. DeVier quickly developed a rapport with QB Ricky Ray in 2017 and was second in the league in receiving with 280 yards, before he missed 6 games due to injury. He returned to the starting lineup in late August. The market certainly marked Posey as a future star and had him sign a bevvy of cards, but this one just stuck out. A great looking card and autograph to boot. Topps for once completely raised the bar. A partially translucent design integrated into a patch autograph card? Take my money please!